Until 1977, the Rebbe received people privately in his study. These meetings are called yechidut - a private audi­ence. Several times a week, between eight p.m. and four in the morning, the Rebbe managed to receive an average of fifty people. The wait for yechidut could last for months. Among those who came for yechidut with the Rebbe were presidents of Israel, heads of the Israeli government, top military officials, ministers, Knesset members, senators from various countries, poets, writers, journalists, and of course plain, ordinary Jews, known in Hebrew as amcha. Quite a few gentiles had private meetings with the Rebbe also. To prepare for yechidut with the Rebbe, a Chabadnik would go to the mikveh, put on a gartel, study the Rebbe's writings, and fast all day. Upon entering the room where the audience was held, the Chassid would not shake the Rebbe' s hand, so as not to reduce this momentous event to the level of a simple meeting between two Jews. Throughout the conversation, the visitor would remain standing out of re­spect for the Rebbe, as well as to emphasize the special sig­nificance and holiness of the occasion. 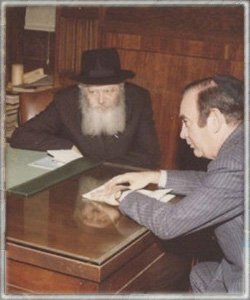 Many of those who had the privilege of a private au­dience with the Rebbe testify that the meeting marked a turning point in their lives. Within minutes, the Rebbe was able to break through the outer shell and penetrate the in­nermost worlds, make an acute diagnosis of the person's mental and spiritual state, and propose a solution. People say that even many years after the yechidut they still re­member every fact, every small detail of that encounter, re­alizing again and again that every word spoken by the Rebbe remains in effect for years. The Rebbe's counsel serves as a compass that guides one's entire life. Many people have described their feelings during their yechidut. Eli Wiesel, a Nobel Prize winning writer, said about his meeting, "Never in my life have I seen such an expressive face, such eyes. They radiate a kind of stem, stimulating and at the same time calming and comforting force. They are imbued with iron willpower. For a fleeting moment, you are afraid - there is a feeling that his look can annihilate. Yet you immediately feel that this look supports and uplifts you. And what inconsolable sorrow it contains! Many years have passed since my first visit to the Rebbe, and yet I still have a feeling that these eyes follow me every step of the way, and read my innermost thoughts." The Rebbe received guests from every part of the world, from all strata of society, and every field of en­deavor. All of them acknowledged the immeasurable great­ness of this man. The Rebbe never differentiated between "ordinary Jews" and dignitaries. An "ordinary Jew" might spend half an hour with the Rebbe, while some important figure or tycoon might be given to understand that the audi­ence is over after a mere minute. The Rebbe always gave his full attention to any problem brought to him. He empathized with his visitor, shared in his suffering and felt his pain. Poor Jews would complain about their difficulties finding matches for their daughters, while Israeli prime ministers discussed the problems facing the State of Israel. From the time that Menachem Mendel became the Rebbe he never set foot outside New York (not counting a half-day trip to a summer camp for children of Lubavitcher Chassidim). Knowing this, visitors were astonished by the Rebbe' s knowledge of every possible subject. The Rebbe is famous for his ability to talk to each person on his own level, using specialized language, discussing physics with physicists, lit­erature with writers, painting with artists, military strategy with army officers, business with economists, displaying professional expertise and full knowledge of recent devel­opments in the area under discussion. One diplomat recounted that the Rebbe analyzed a situation as if he had access to the latest secret service intel­ligence reports. A famous nuclear scientist writes, "The Rebbe's knowledge in the field of nuclear physics is so pro­found that one might think he was a physics professor at Princeton University." Israeli Brigadier-General Ran Peker was astonished when he was asked by the Rebbe why Israeli warplanes had bombed Syrian airfields from a certain angle rather than an­other. The Rebbe was of the opinion that the chosen bomb­ing angle was incorrect, and the second-in-command of Is­rael's Air Force had no choice but to agree. A famous newly observant professor of microbiology once delivered to the Rebbe, at his request, forty volumes (!) of scientific reports commissioned by the American government space agency in connection with the moon landing. The professor was convinced that the Rebbe would not have the time to read through all that extensive research. How­ever, several months later, during another yechidut, the pro­fessor was astounded when the Rebbe casually pointed out a serious contradiction between a conclusion reached in Vol­ume 18 and another one in Volume 38. A professor of physical engineering told the Rebbe about a certain scientific invention and the highly complex computations that would result in a pilot device based on that invention. The professor presented the Rebbe with a se­ries of typical numbers obtained in the course of the re­search. The Rebbe instantly noted that two of the numbers were mutually exclusive. The professor objected that all the calculations had been done on the large university super­computers, and that the program had been designed in ac­cordance with the latest infallible theories. The Rebbe smiled and said that, despite his enormous respect for the experts, he insists that the two numbers were mutually in­consistent. As a result, an entire team of scientists began to search for the error, and it took two years until a fault was discovered in one of the formulas entered in the program. How can one explain these unique abilities possessed by the Rebbe? Can there even be a rational, logical explana­tion? We will probably never know for certain. Certainly, the Rebbe's secular knowledge - extensive as it may be ­does not explain his intuitive ability to answer questions in almost any field. Obviously, art, economics, and physics have not been the Rebbe's top priorities. The Rebbe was truly concerned with one thing only: bringing Jews closer to Judaism, the Torah, and the Creator. The Book of Mishlei says, "In all thy ways know Him." Accordingly, the Rebbe believes that if knowledge of science, literature, art, or any other secular field will help and/or unite the Jews, that knowledge should be used.